One of areas targeted by the Prince’s Regeneration Summit is Burslem (one of the six towns that make up Stoke-on-Trent, doncha know?). They have a vibrant minicab service getting people to and fro the federation of towns but far too many boarded up shops and houses in each of them. 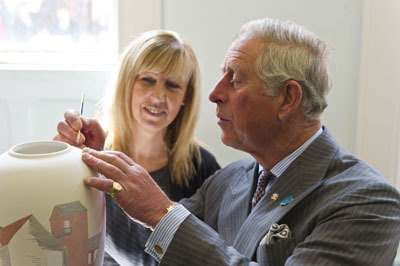 The aim of The Prince’s Regeneration Trust here is to continue the work of restoring Middleport Pottery, ‘providing jobs and training opportunities for local people, creating new courses in local schools and colleges, and inspiring a whole community to raise its aspirations’. Not a small task. Prince Charles spoke to so many people involved in the regeneration work and I photographed them all as the entourage bustled through the town. One of the only peaceful moments was when he was invited to take a seat and finish off painting a piece of pottery. An air of calm descended on the room as he quietly took up the brush (I think they knew he enjoys painting).